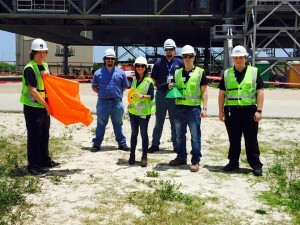 Kiara Rodriguez and her Valencia College engineering classmates spent much of the summer on a mission – one handed to them by NASA and the Astronaut Memorial Foundation. The assignment? To spend one month designing and building a small parachute that could safely carry a 16.9-ounce bottle of water to the ground. And the best part? 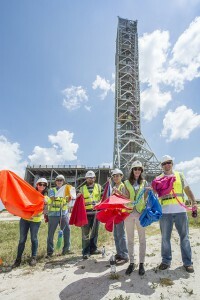 On July 1, they got to drop their parachutes from a platform 250 feet in the air on NASA’s Mobile Launcher at the Kennedy Space Center. “The whole experience was very cool,” said Sean Brooks, 28, an engineering student and member of Team Gravity, one of five teams that competed in the contest. Team Gravity finished second in the competition, behind Team NAPA, comprised of Brandon Chaney, Kiara Rodriguez, Conan Wilson and Michael Workman. Team NAPA shows off their winning design. The goal was to allow the 26 Valencia students – most of whom were engineering students – to collaborate on a project, develop time-management skills, and create a professional presentation to show three judges – two NASA engineers and one engineer from Lockheed Martin. 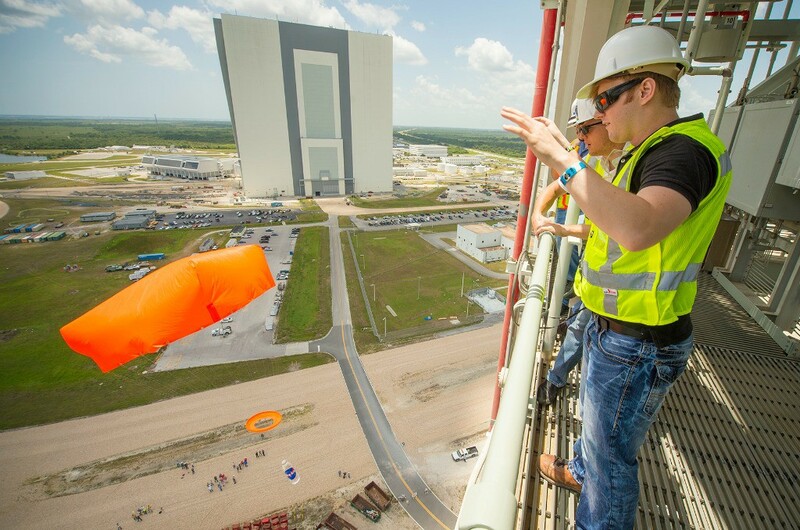 The parachute design challenge was part of a workshop set up by Sen. Thad Altman, president of the nonprofit Astronaut Memorial Foundation, who wanted college students to experience some of the behind-the-scenes work that goes on at the Kennedy Space Center. The teams show off their parachute designs. For nearly a month, the students worked together to research, design and assemble their parachutes. They turned to engineering professors for help and Skyped with NASA engineers. One team took inspiration from Leonardo DaVinci’s aerial screw – and incorporated that complex design into their own parachute. Another team started out attempting to make a parachute out of a shower curtain. But after the first trial – when one of the extending rods nearly hit a team member in the head – they changed plans and settled on a design that featured one larger parachute and a trio of smaller parachutes. Team member Rankhses Dominguez even crocheted a bag to hold the payload – a plastic water bottle. The students experimented with many different materials, from garbage bags to parachute material, zip-ties and dental floss. Some held their water bottles with strings or even a beer koozie. The goal was to make the parachute durable but inexpensive. Although most of the teams spent around $40 on their parachutes, Team Gravity – comprised of students Vernon Allen, Daniel Barkley, Sean Brooks, Tyler Coleman and Caleb Stephan – spent less than $20, using parachute cord, Scotch tape, zip-ties and ripstop nylon for the parachute material. Along the way, they also discovered the best way to cut the nylon was to use a soldering iron – which bound the edges and kept the material from fraying. Team Real Drag — whose motto was “Falling with Style” from the movie “Toy Story” – created a complex parafoil parachute. “We opted for something more challenging than a round parachute,” said team member Victor Petrillo. Before heading to Kennedy Space Center, all the teams tested their parachute designs – by dropping their parachutes off the fifth-floor roof of Valencia College’s district office. The winds and trees worked against them, however, sending several parachutes into nearby trees, while others got snagged on the building’s gutters. At the Space Center, however, Launch Day brought light winds, a good sign for the parachute teams. 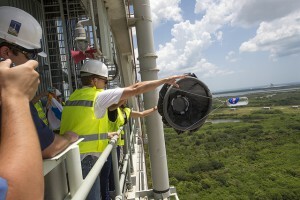 The 26 engineering students – along with about two dozen NASA officials and Valencia engineering instructors — stood on the ground at Cape Canaveral and cheered as each team sent one representative up on the Mobile Launcher to drop their parachutes. The team representatives, along with NASA officials, climbed three flights of stairs, then took an elevator to the 250-foot platform. “Your ears definitely pop as you’re going up,” said Brooks. Each team got the chance to drop their parachutes twice, while a NASA official recorded how long the parachutes stayed aloft. The team whose parachute stayed aloft the longest – meaning a slow, steady descent to the ground – earned the most points. One team launches their parachute, which was made from garbage bags. Team Gravity’s parachute had one great drop – and the single longest hang time — but their hopes dimmed a bit as they watched the orange parachute of Team NAPA glide slowly to the ground. “I think the orange chute is the one to beat,” said Gravity team member Tyler Coleman. It was, but members of the winning team, Team NAPA, weren’t brimming with confidence. “We had tested the prototype and it did really well for a few seconds, but then it got stuck on a palm frond,” said Rodriguez. The team also tinkered with their design quite a bit – and incorporated a Frisbee, cutting out the center of the disc, to serve as a slider – and prevent the lines from tangling. On Launch Day, however, their Frisbee design proved to be a winner. “It was really awesome!” said Rodriguez. But there were no losers during this design challenge, noted one judge. In engineering, he noted, the teams that didn’t win may have learned more than the winners. Click here to see photos from the engineering students’ trip to Kennedy Space Center.